HL800 Shiploader is standardized for movable shiploading applications. 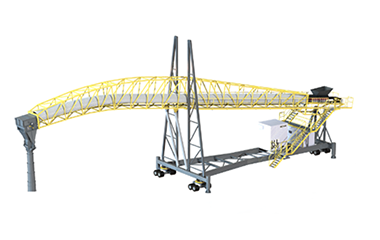 It is an optimal solution for multi-purpose quay and vessel sizes under 30 000 dwt. 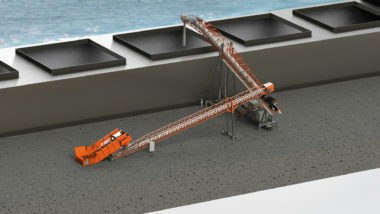 HL800 is independently moving shiploader with luffing boom and it is fed by a link conveyor. 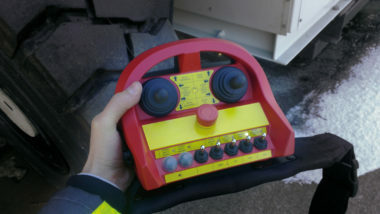 Remote control enables flexible operating. HL800 Shiploader travels on rubber tires and has five (5) different driving modes. It can be moved to parking position when not used for shiploading. HL800 Shiploader is equipped with electrical and mechanical safety devices to protect operators and structures for damage. 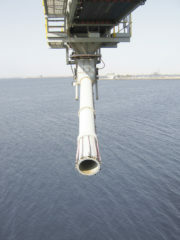 The Shiploader is supplied according to European Machine Directive. Automatic lubrication, dust suppression system, operators cabin, ATEX classifaction, different loading chutes and preassembly for faster installation.